I usually find that decorating my fireplace after Christmas is fairly easy. Often times, I already know what I want to do while I’m right in the midst of taking my decorations down. But, that wasn’t the case for me this year. I must have been all decorated-out after the flurry surrounding the holidays and my creativity seemed to have left me in a lurch. No matter how much I stared and stared at my fireplace, nothing would come to me! YOU’LL FIND A SHOPPING GUIDE TO GET MY LOOK AT THE END OF THIS POST! I used to fret about such things, but I’ve learned over the years to just relax and something will eventually come to me. Well…that something came to me when Pookie and I were out hitting a few of the after Christmas sales! Oh, how I love shopping after Christmas! Not the first day or even the second day after Christmas – it’s too crowded. I prefer to wait several days afterwards and then start hitting some of my favorite stores. By then, most stores have marked their items down to rock bottom prices! My first bit of inspiration struck at the dollar store where they had all of their Christmas marked 50% off – that’s 50¢, y’all! That was where I spied tons of snowflakes I had found my theme! 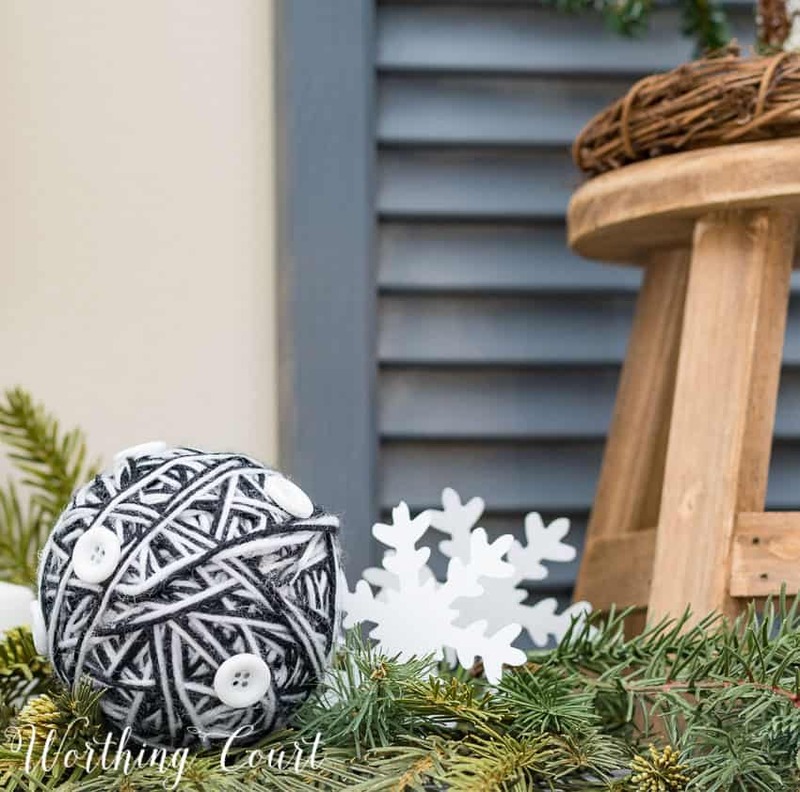 Then, I found several different styles of adorable black and white Nordic-look sweater and yarn-wrapped ornaments, at a different store, and my mantel plan was born! I left the layer of faux greenery from Christmas in place and proceeded to decorate away! The Nordic ornaments were placed here and there. As a final snowy touch, I scattered snowflakes around that I cut out with a snowflake punch and white cardstock. 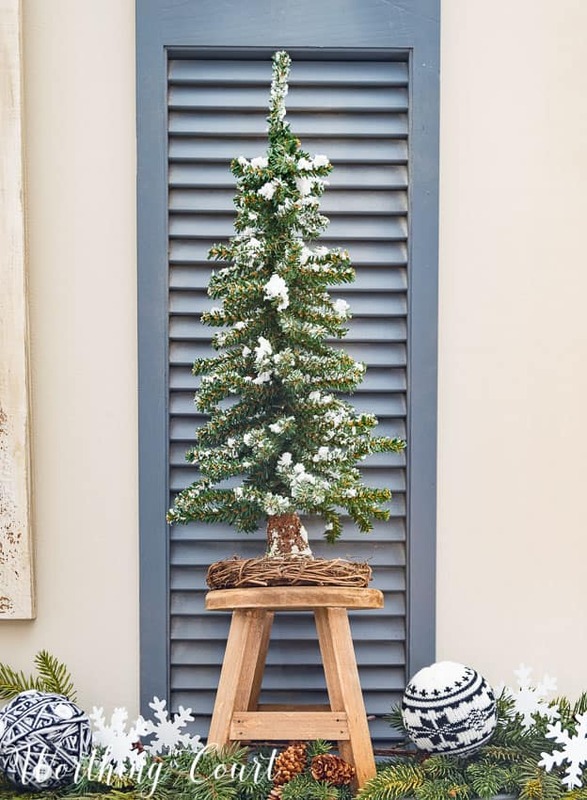 Cute little wooden stools were perfect for topping with my snow covered faux mini trees. And the leaning shutters behind them make a great backdrop. A trip to a local fabric store allowed me get what I needed to created the wreath above the mantel. The wreath and snowflakes were soooo easy, y’all! You can find the step by step tutorial by clicking HERE. It turned out to be a little bit prophetic that I used a snowy theme for my fireplace, because here’s what we woke up to Saturday morning. This is what over 8″ of snow looks like at my house in North Carolina! I try to do something different with my fireplace every season. Check out how I decorated it last winter HERE. Wood and Metal Wall Plaque – Kirkland’s (on sale! ), Mine has been painted. I just love the plaid wreath! Looks so homey!!! Beautiful room – love the wreat. I am looking forward to the tutorial. Beautiful and so appropriate for Winter. Thank you for providing the shopping guide…just one of many reasons I love your blog! Always love your mantles and appreciate your explanation of how they evolved. Thanks! Looks beautiful and just in time for the winter snow! Thanks for the ideas. It’s always hard for me to know how to decorate after Christmas. Thanks for the great tips! Your fireplace mantle looks great. I love the snowflakes and am anxious to see how you did them. 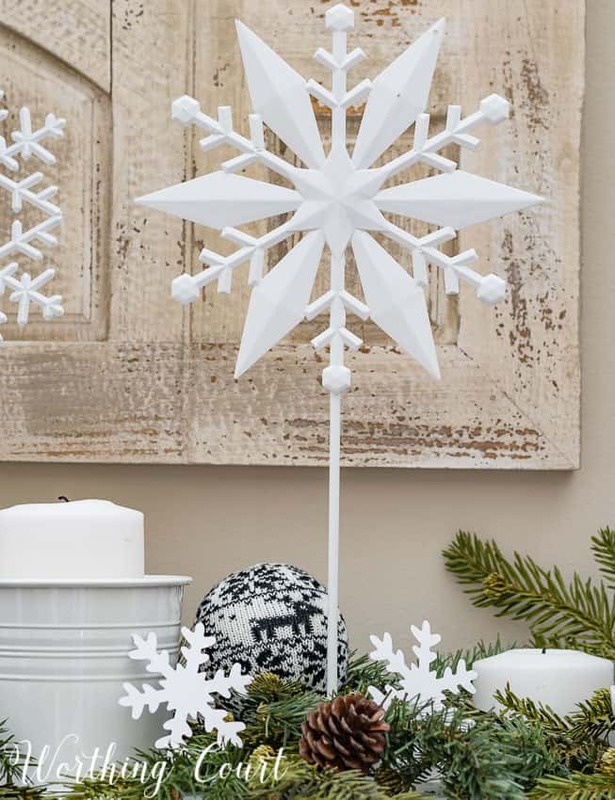 Love your decor and looking forward to the snowflake tutorial. Love your mantle. I wished I would have not packed my trees & snowflakes away with my Christmas stuff. I live in the North Carolina Mountains, close to Asheville and am curious as to where you live. Love, Love my mountains and would not be happy any where else. I am a retired visual arts instructor but still love to paint, decorate, etc. Love your site. Hi Pam. I’m in Greensboro, NC. I lived in Asheville for a few years as a child, 10 – 15 years old. I was too young to appreciate the beauty of the mountains then, but oh, how my mom loved them! I love, love, love going back for visits! Hi Suzy, I’m replying to this comment because I couldn’t see where to leave a new comment. I’m wondering what measurement of shutters you chose from Wayfair. Thanks!! Hi Liz. The gray shutters that you see on my mantel are actually old bifold doors that I took apart and cut in half a long time ago. 🙂 If I were to actually use shutters, I would probably order the 35″ x 15″ size from Wayfair. Of course, the size you select depends upon what would work in your setting. For future reference, you should be able to scroll all the way to the bottom of the comments to see a spot where you can leave a new comment. Love this look! After I stopped turning my Christmas tree lights on in the evening (but had yet to take it down), I still turned on the lights in the greenery on my mantle. That’s when I asked myself, “What law says I have to stop lighting my mantle just because Christmas is over!” I created a similar look and will enjoy the soft glow of my lighted greenery into February! Thanks for the inspiration and confirmation! 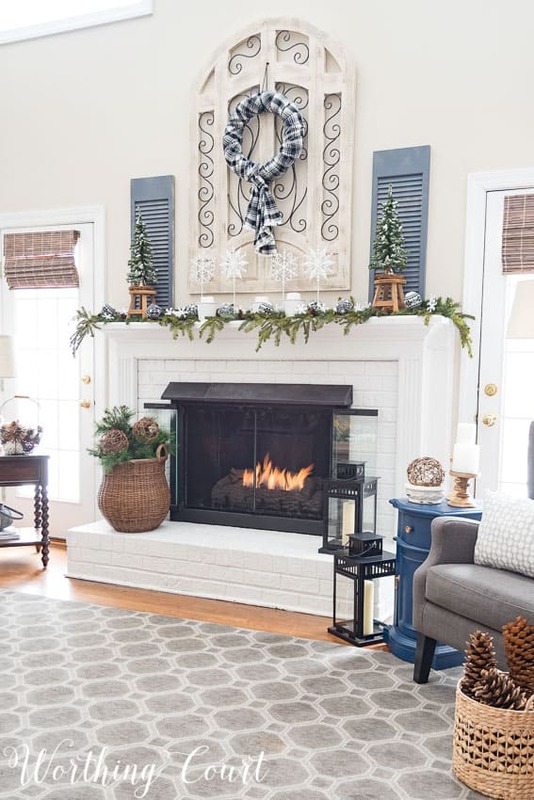 Love your snowy winter fireplace, Suzy! You never disappoint when it come to your decorating! Can’t wait for the tutorials on the wreath and the snowflakes! What a beautiful mantle for winter. I adore the scarf wreath. You may have posted this somewhere, but do you mind sharing your wall color? Hi Lauren. I’m happy to share! Our entire house is painted with Sherwin Williams Accessible Beige. Love your mantle with the black touches. Suzy, the picture if your house covered with snow is so beautiful. What a beautiful view of your home. Your fireplace and mantel make me want to come over for a cup of tea! May take me awhile, I’m coming from Ohio! Loved the fireplace! Should have decorated mine also but like you just couldn’t wrap my mind around anything. Beautiful! Inspires me to want to do something with my fireplace. I absolutely LOVE it! Am totally in love with the black and white wreath and look forward to the tutorial. Thank you so much for sharing your beautiful home and creative ideas. Beautiful! Your home is amazing. So pretty! I’m remodeling my home right now and basically using your designs as my inspiration. Thank you for doing the hard work for me! Love your mantle. I have yet to disassemble my mantle, because I enjoy it so much. I believe I will also keep my little white lights and greenery. I also am leaving my 3 lanterns out. I adore those alpine Nordic yarn ornaments. Did these really come from the Dollar Tree store? There are a lot of hidden treasures to be found there. Hi Bev. You’re so right about finding hidden treasures at Dollar Tree, but the Nordic ornaments didn’t come from there – only the snowflakes did. I found the Nordic ornaments at At Home in their Christmas clearance. Sorry for the confusion! Omg, so pretty!! Thank you for providing the sources… I would like to get a couple of those little footstools also! Thank you for providing the sources… I would like to get a couple of those little footstools also! Very nice! love it and I want to thank you for list of where you bought you stuff. 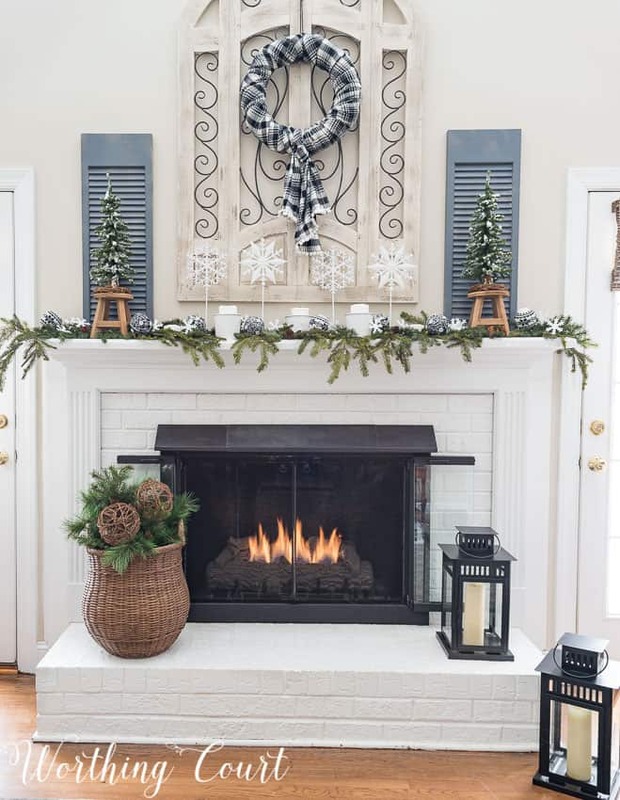 Love your mantle – in all seasons! I can’t wait to see the tutorial on how to make the wreath. Beautiful, Suzy! I need a fireplace. Or a mantle. Something to decorate besides bookshelves! Love this look to continue through until spring gets a little closer. I love the snowflakes! 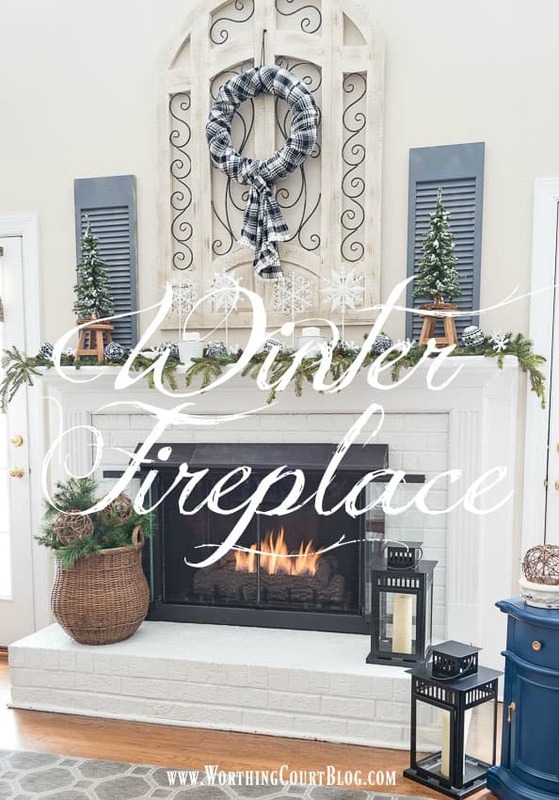 I have a big fireplace/mantle and it’s perfect for something like this however I live in So Cal and snowflakes in a place where it never snows just seem wrong! I love it. Thank you for encouraging me to shop at the dollar store. The black and white Nordic-look sweater and yarn-wrapped ornaments are so cute. The dollar store does have such treasures. SOOO excited to see the tutorial on the snowflakes. I’m figuring you mean the standing ones… I hope! It looks lovely, Suzy! Definitely a room I would like to sit and snuggle up in a chair. Love your mantle. The shutters and trees are beautiful. I love your Winter mantle! The little trees on top of the stools are adorable and so creative! I really like the black and white elements of your mantel display. Very clean and simple. I love your blog it is the first thing I check in the morning . 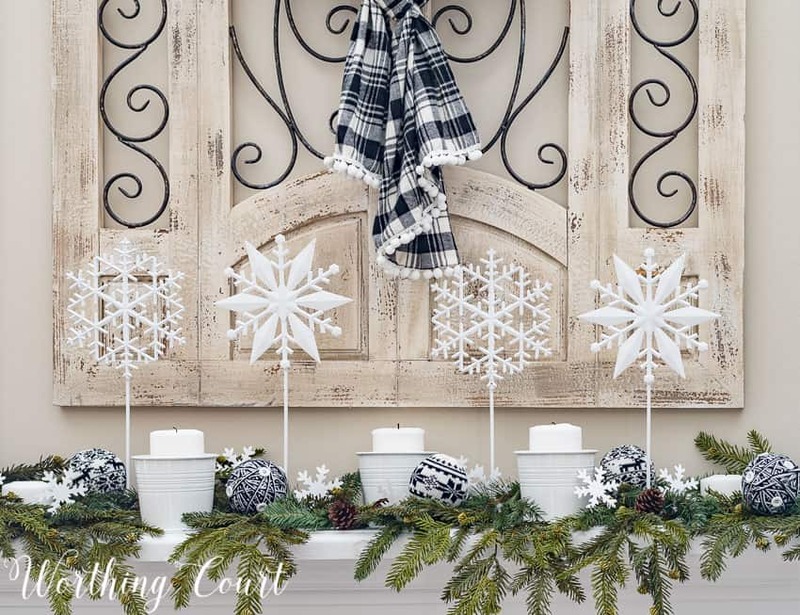 Love the idea of the snowflakes so cheap and easy but makes a cute display. Could be used many places like a tablescrape or buffet thank you so much for the idea. Saved both to my Pinterest board, Suzy! I was really excited to learn how you did the snowflakes! Thank you! 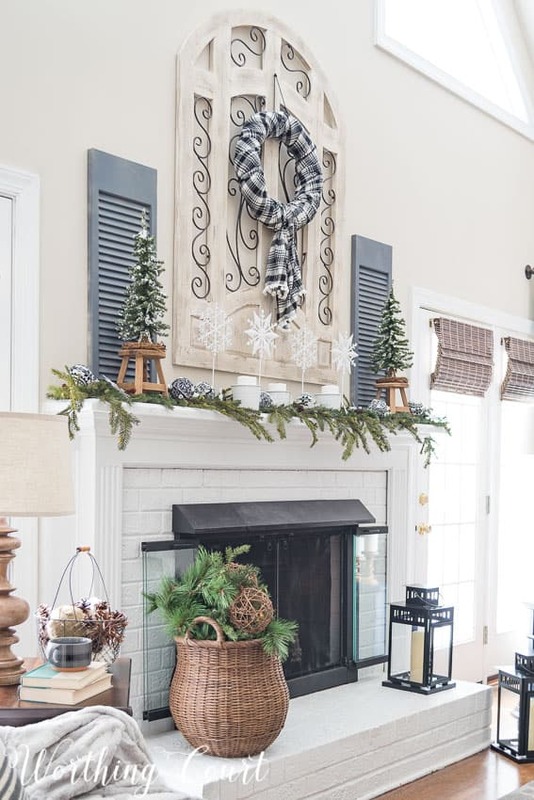 Your winter mantel is just darling! I always struggle about what to do after Christmas is over because it is so dreary (inside and out) after the holidays. I’m going to copy your ideas (if it’s okay?) Happy New Year to you and enjoy your snow. Your mantle is beautiful and very peaceful looking. Thank you for the how~to’s and lists of sources. 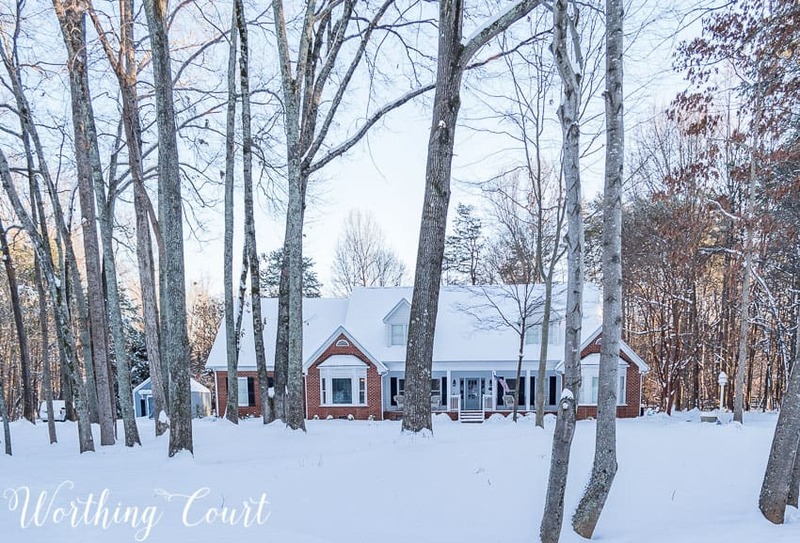 Your snow~filled photo of your home looks like a Christmas card. This is my first time on your blog and its stunning. The wreath in this post really caught my eye. Its simple and a show stopper. Wow, this looks lovely.. I’m going to give the wreath a try.. Your mantel and the snow are beautiful as is your home! Stay warm. Enjoying you taste in decorating. I continued using my greens and cones from Christmas. Trying to decide how long to keep them up. Eager to see when you decide to change yours out. Suzy, I always love your style and décor choices! This mantle is so perfect. Love it! Thanks for sharing it this week at the Family Joy Blog Link Party. So beautiful…I love those little wooden stools! I am so happy to have happened upon your amazing blog. I cannot wait to share your awesomeness with family and friends! Thanks for welcoming us into your home! Cannot wait to share your awesome blog with my friends and family! Thank you for allowing us into your beautiful home! This is so beautiful ! I love what you did. 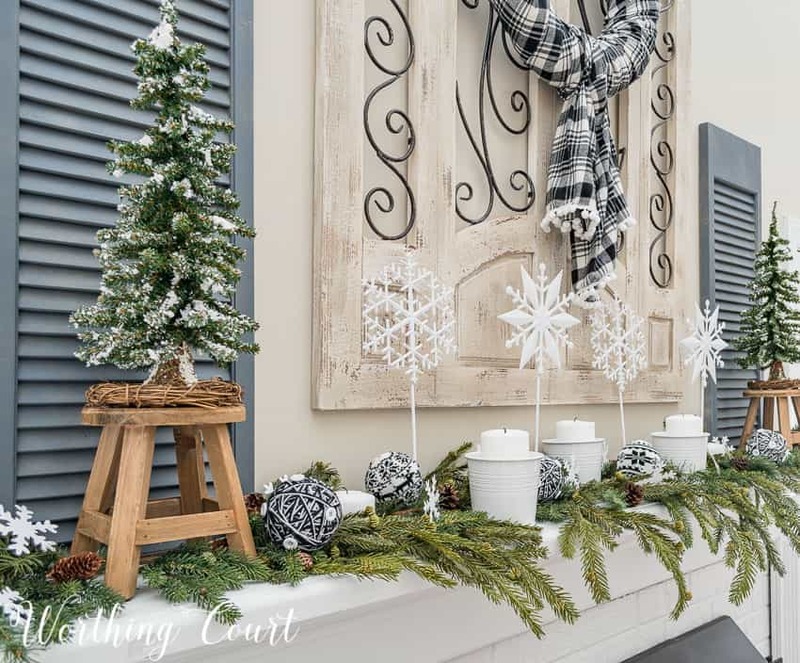 I love the way you incorporate your Christmas into winter decor. I am trying to learn to do this . I love the blue plaid wreath, I think I may make a red version for my dining room! 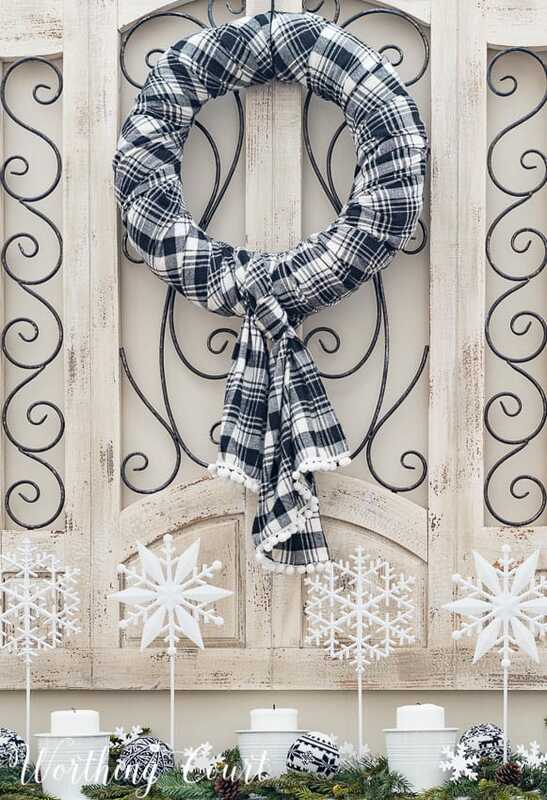 Love the plaid winter wreath! Absolutely love your fireplace, especially, the large metal and wood piece over it. I love the way that you painted it, giving it an entirely different look from the one on the website. Such creativity. 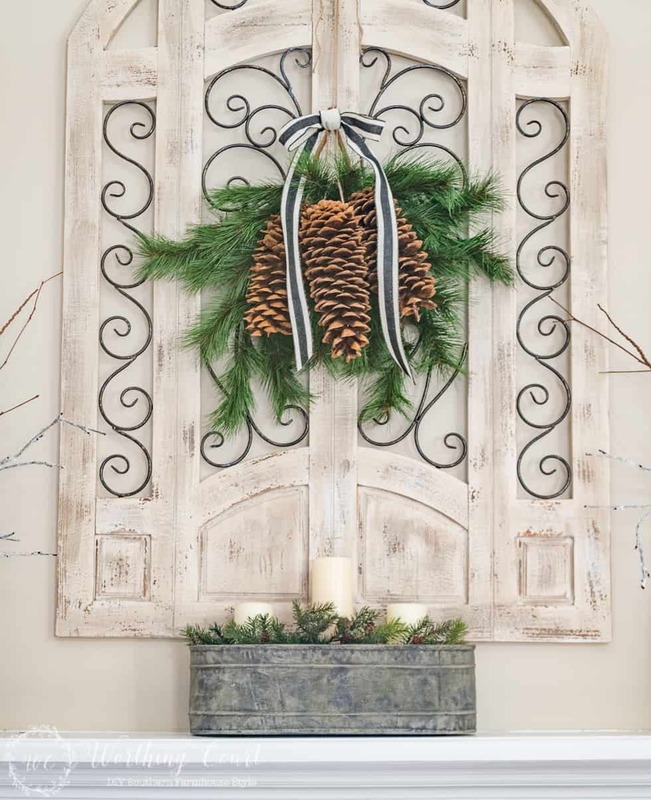 As always just lovely…Love the wreath and will be working on making one myself…Just beautifully put together. Looking forward to you ideas for 2018. I love the Black and White Touches makes it look classy!